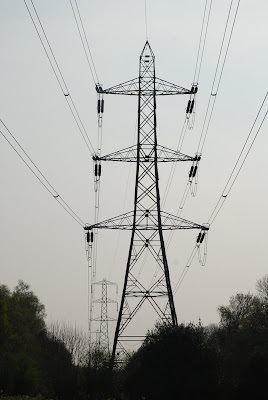 My daughter Clare loves pylons and hearing so much about how beautiful they looked I learnt to see beauty in them. I found these in Lyminge. very beautiful but I wouldn't linger under one for long. As a high voltage line worker I find this photo very interesting. Though in different countries, the construction is basically the same. While necessary to carry the high voltage electricity, take it from me; they are uncomfortable to climb and work on. Necessary though they are, I can't say that I've ever experienced anything but fear whenever I'm near them Rose, certainly not beauty. Is your daughter an electrical engineer? Sorry - I don't share the love of these beasts. We have so many. San Diego's wires are going underground little by little but my neighborhood is not scheduled unitl 2013!